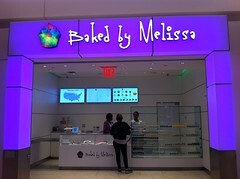 Baked by Melissa mini cupcakes now selling at JFK airport, a photo by Rachel from Cupcakes Take the Cake on Flickr. Full report soon. And they're chocolate covered mini cupcakes, previously only sold as a box set, are now $2 each.